For those who are not familiar with “Yooper’s,” it means someone who lives in the Upper Peninsula of Michigan, AKA the UP (not up, U-P), which translates to Yooper. Long explanation for a funny name. At the turn of the century, many people from Finland settled in the UP because it looks so much like Finland with an abundance of trees, wildlife, and a huge lake, in this case, Lake Superior. My husband’s grandparents came over from Finland and he still has cousins living in the UP. Which brings me to Lolly, our Yooper cousin. 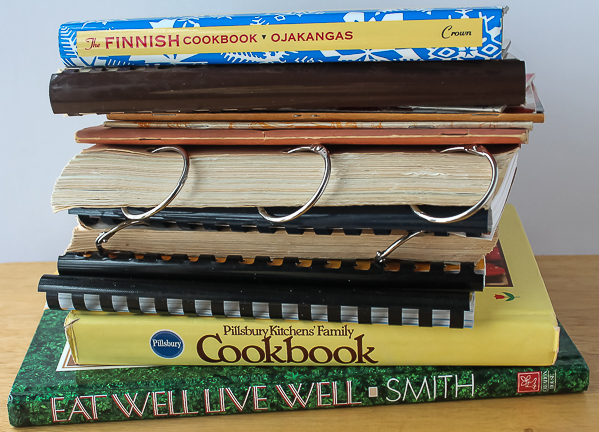 As you can see, Lolly gave me piles of cookbooks including a Finnish one of course. The spiral bound and ring ones are all from local schools, churches, and organizations. 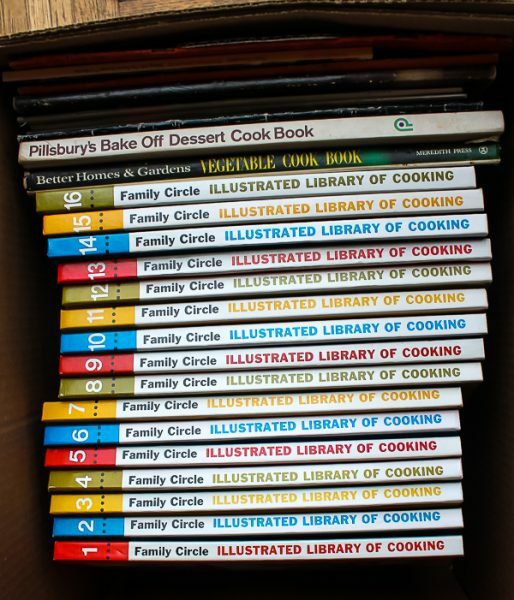 Lolly must have known about my love of Pillsbury books and included a couple. I love the old encyclopedia books from the magazines. Someone else had sent me the Woman’s Day volumes and now I have the Family Circle. I can spend hours looking through those gems. Classic recipes, and so much fun to read on cold days wrapped up in a blanket. 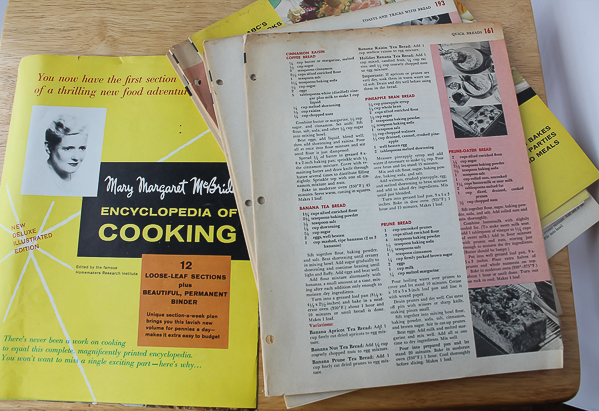 But this one really got my attention – an old Mary Margaret McBride Encyclopedia of Cooking. 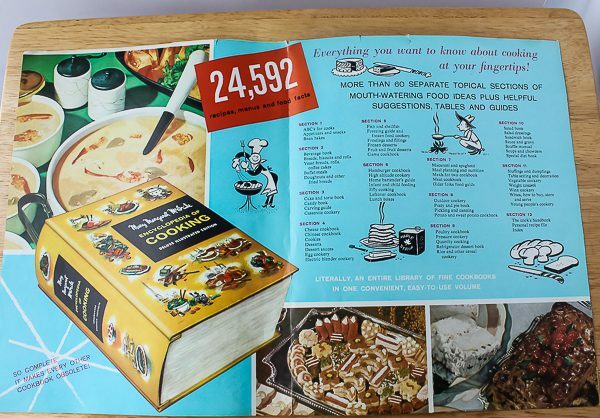 Back in the early 1960’s, grocery stores would offer these encyclopedia of cooking packets. One would initially buy a spiral-bound cover, and then every few weeks buy a new volume to add. This particular one Lolly gave me originally had twelve volumes. Mary Margaret McBride’s recipes were very sought after. She wrote freelance for many publications, not just food-oriented, but also travel and topical news. Most popular were her early radio broadcasts which was her main work as she became known at one time as “The First Lady of Radio,” and earned a star on the Hollywood Walk of Fame for her radio work. I looked through every delightful page and thought I would never be able to select one recipe to feature. 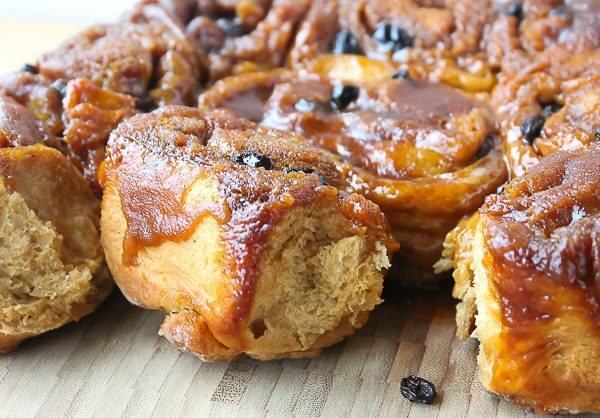 But when I was checking my calendar over the weekend, I discovered that February 21st was National Sticky Bun Day. I went to the sweet bread section of the booklet and found “Molasses Taffy Rolls,” which it was suggested to make two different breads from one dough. In this case, it was “Molasses Taffy Cinnamon Rolls,” and “Hot Cross Buns,” which was a little strange because these were not traditional Hot Cross Buns, but it was the sticky buns I was interested in to mark the National Day. These delicious buns were indeed sticky and really good. I also made the Hot Cross Buns, but truthfully, after tasting the sticky buns, I found myself wishing I had made two batches of the sticky buns! Thank you, Lolly, for all the books. I wish you could have tasted the sticky buns! Scald milk; pour into large mixing bowl. Add salt and shortening; stir until shortening is melted. Add molasses and stir to blend. Sprinkle yeast in lukewarm water. Add sugar; let stand 5 minutes. Stir after 5 minutes and add to molasses-milk mixture. Add beaten eggs and mix well. Stir in 3 cups of the flour and beat until smooth. Add another 2 to 2-1/2 cups flour to make a smooth dough, but still sticky. Spread out about ½ cup of flour on work surface and pile on dough. Knead dough gently until smooth and elastic, but not stiff. It should be a soft dough that is slightly firm. Place kneaded dough in a greased bowl, turn dough over once to bring greased side up. Cover bowl and let dough rise in a warm place until double in bulk, about 1-1/2 hours. Melt 2 Tablespoons of butter in an 8-by-8-inch square pan. Stir in ⅓ cup of sugar mixed with 2 Tablespoons of molasses, right in the pan with the melted butter. Set aside. Roll out half of the master dough into a rectangle 11-by-16-inches. Melt 1 Tablespoon of butter and brush over dough. Mix together ⅓ cup sugar , ½ teaspoon ground cinnamon, and ½ cup dark raisins. Sprinkle over dough. Roll up dough beginning at long end and pinch seam to seal. Cut dough into 9 equal pieces and place cut side down in prepared pan with the molasses-butter mixture. Cover and let rise until double, about 1 hour to 1-1/2 hours. Bake at 375 degrees F for 25 minutes or until golden and center roll is cooked through. Remove from oven and immediately turn pan out onto a serving plate and slowly lift pan off. Scrape up any glaze that may be sticking to the pan and pour over hot rolls. Makes 9 rolls. Form the other half of the master recipe dough into 2 rolls, 9-inches long. Cut into 1-inch slices, making 1-1/2 dozen. Form each slice into a ball and place equally in 2 greased 8-inch round cake pans. Let rise until double in bulk, about 1 to 1-1/2 hours. Bake at 375 degrees F for about 20 minutes or until golden. Remove pans to wire rack to cool. 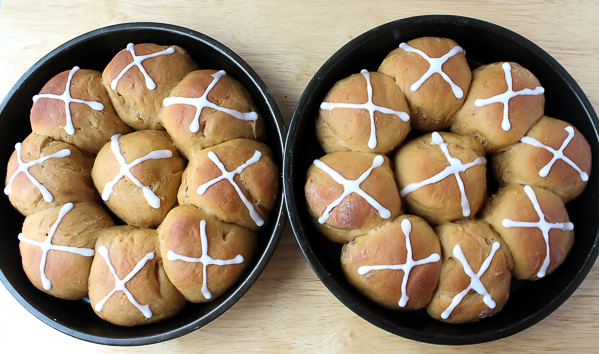 To decorate for Hot Cross Buns, mix together ½ cup confectioner's sugar and 2 to 3 teaspoons of water or milk. Place in pastry bag and make X's on each roll. Makes 1-1/2 dozen buns. A fun read and the sticky buns look delish! The buns are ooey gooey good!